Embroidered tablecloths have always held a special fascination for the founder of ERI and were often the object of desire as a collector, even in the formative years of childhood. However, it was not until 1995 that this passion was translated into a business model – the production of exclusive table- and bedlinen solely by hand. This idea marked the birth of “ERI Textiles GmbH”. The driving force behind the company is Erika Lassen, the creative spirit responsible for designing, producing and marketing some of the most exquisite table- and bedlinen imaginable. Linen in its most magnificent form and hand-embroidered has become the hallmark of ERI Textiles. 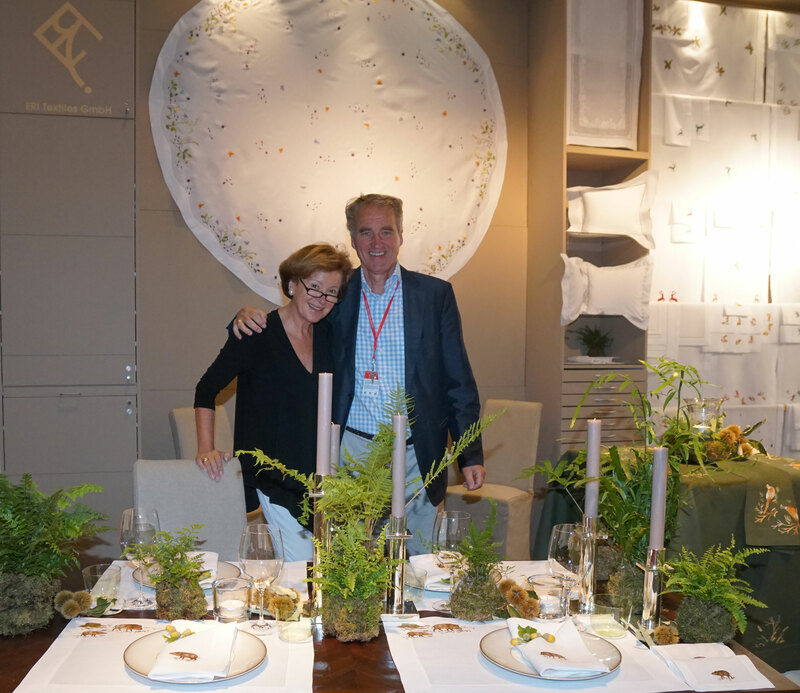 Belgian and Italian linen – “Masters of Linen” – forms the basis for all collections of tablecloths, sets, napkins and bedlinen produced by the company. Working from her studio in the Bavarian town of Seefeld, Erika Lassen designs samples of themes such as the elegant rolling “Fern“, the exclusive and wonderful “Classica“ or the nearly animated emerging “Sledge Drivers“ which are later incorporated into the various collections. Creativeness, elegance and precision are the brand label of our sophisticated and fine hand embroidery. Those among you who have embarked on an embroidery project will recognize that the masterpieces created by Erika Lassen are a labor of love – a product of unique beauty rather than mass-produced, low-budget items. Customers with special requests and design wishes should note that the production process may span anything up to four months – time well spent if you are looking for something truly particular. Producing collections of outstanding craftsmanship, ERI Textiles has been quick to establish an extensive customer base of connoisseurs around the globe. They all share a common passion: exclusive design. Timeless and elegant: these are the attributes associated with ERI Textiles table- and bedlinen – special ambience guaranteed.